Description: O. depressa is a small, flattened nudibranch, reaching only 9mm in length. The body is translucent white with regular spots of red-brown pigment that is concentrated on the middle of the back. The spicules that are incorporated in the mantle can be distinguished with a hand lens. This species has distinctive long hairy transparent tubercles all over its back. The rhinophores are lamellate. 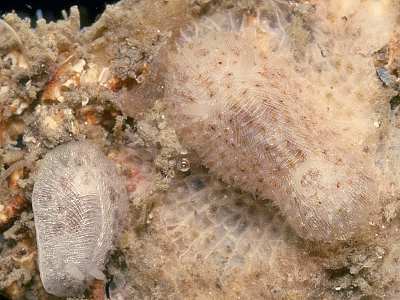 Habitat: This animal feeds on the encrusting bryozoan Schizomavella linearis. It is normally found under stones on the shore or in shallow water. The spawn is a very fine pink thread laid in a neat spiral. Distribution: Found all around the British Isles, but rarely recorded due to its small size and good camouflage. It has been recorded as far north as the Orkneys and south to the Atlantic coast of France and the Mediterranean Sea. Long hair-like tubercles and spots of brown pigment. Picton, B.E. & Morrow, C.C. (2016). Onchidoris depressa (Alder & Hancock, 1842). [In] Encyclopedia of Marine Life of Britain and Ireland.